When California meets Copenhagen, you get West Coast Nordic. Kristen, aka @rootedfood, is adjunct faculty at UC Berkeley and a registered dietitian nutritionst. 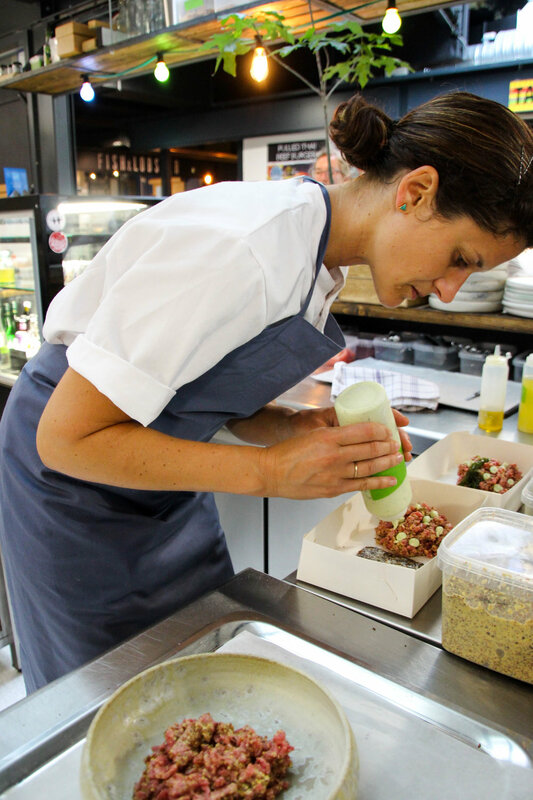 Most notably, however, Kristen is a gastronomical entrepreneur who is pursuing her passion for West Coast Nordic cuisine. Kristen has Danish roots (her last name is Rasmussen, which is akin to the "Smith" of Denmark) and has spent extensive time in Copenhagen, including completing internship at the Nordic Food Lab, to learn about Danish culinary traditions. The essence of Nordic food is using natural resources from the Nordic larder. Situated in the far northern hemisphere, Denmark's climate is cool and rainy. Therefore, foods like cured and smoked fish and meats, potatoes, and rooted vegetables dominate the cuisine. There are also a lot of similarities between New Nordic cuisine and West Coast cuisine: Both emphasize seasonal, local, and organic ingredients that are prepared and served with an element of surprise. These similarities make for a nearly seamless merging of the two culinary approaches. Building off of the success of her porridge pop-ups in the Bay Area, Kristen is now pursuing West Coast Nordic smørrebrød. Smørrebrød is a classic, open-faced sandwich that is a staple in the diet of Danes. Perhaps the essence of smørrebrød is rugbrød, or rye bread. Rugbrød, is the most popular savory bread eaten in Denmark, and it is found at nearly every meal. Packed with different seeds, grains, and cracked rye, this dark and dense fermented sourdough bread creates a perfect vessel for robust toppings, which is why it is the bread of choice for smørrebrød. Smørrebrød typically consists of buttered rugbrød, which is then topped off with different schmears, cuts of meat, fish, local vegetables, and/or cheeses. Kristen is hoping to import that same enthusiasm for smørrebrød back to the West Coast in the USA. 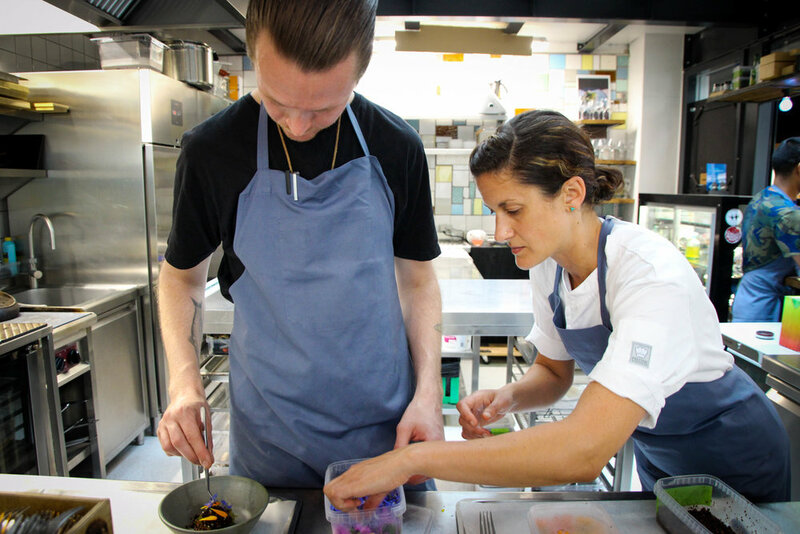 As a summer apprentice at Selma, which is located in Copenhagen's West Market, Kristen learned staging techniques that will elevate her food concept to the next level. For the Rooted Foods x Selma pop up, she created three innovative smørrebrød sandwiches, which you won't find anywhere in Denmark. One should, however, expect to find them in the Bay Area soon. 1) California BLT: Bacon, little gems, tomato, and charred avocado with serrano aioli and shisho. 2) Carrots: Roasted pomegranate carrot with lebna, flowering coriander, tahini, buckwheat, and toasted rye bread. 3) S'more: Flamed (foraged) beach rose marshmallow, crispy rye, cardamon chocolate, raspberry rhubarb compote, and toasted almonds. i) Herbsalted salmon from Faraoe Islands with fromage blanc, radish, chives, cress, and buckwheat. 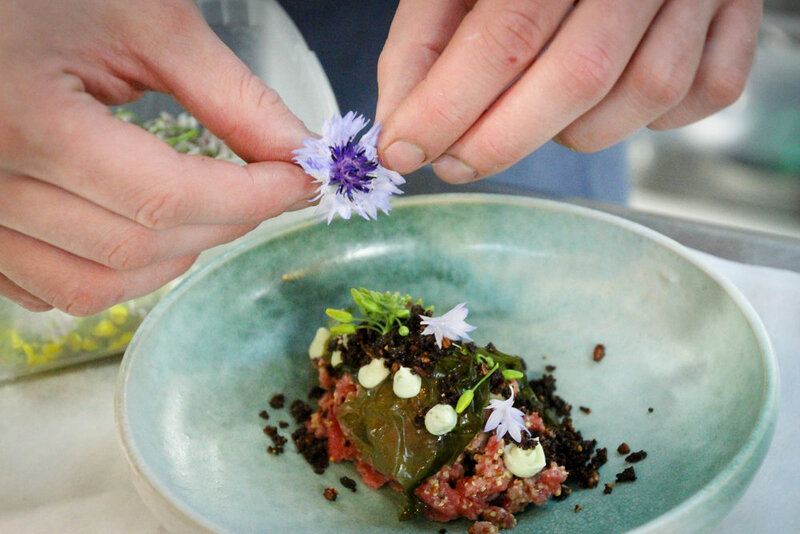 ii) Tartar of beef with Lovage, amaranth, pickled seaweed and ryebread. Check out the gallery of photos from the rest of the evening. Check out Rooted Foods events page to learn how you can experience Kristen's West Coast Nordic Food.